Don Draper you stylish, stylish man. If anybody is not familiar with the AMC series then firstly, where have you been since 2007, and secondly, do not fear my friend, it is good enough for you to binge watch all in one go and pretend you were a fan from the start. 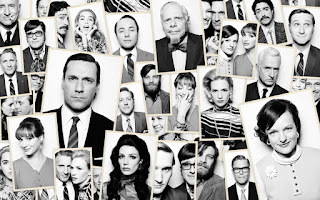 The series starts in the spring of 1960, and follows protagonist Draper and his family and colleagues... and many, many women into the winter of 1970. And as a result we get to see the best (and worst) of the trends that the sixties had to offer us. It's not just Draper's latest wrongdoings that got everyone tuning in (which were pretty ah-may-zing) but the equally as exciting work of the costume and props department. Aside from the general ace-ness of the sixties A-line skirts and the men's perfectly fitted suits, there was that time that copywriter Paul became a Hare Krishna. Yes, let's all take a minute to remember this beautiful episode. But the decor gives just as good as the clothes. 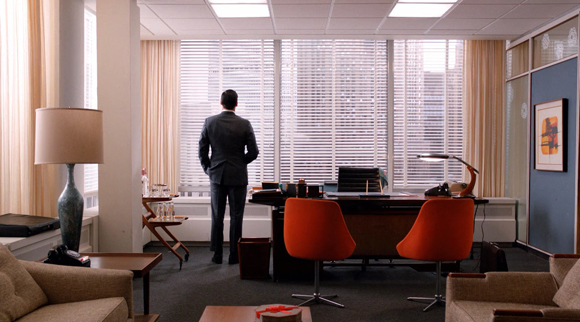 Dan Bishop, production designer, and Claudette Didul, set decorator, are the two main forces behind the final interiors we get to see, but the show's creator Matthew Weiner's dedication to staying completely loyal to history also plays a key part. He ensures every aspect of his set is true to its time in history and the result is impeccable. Rumour has it that he once even asked for a bowl of apples to be removed from the scene as he thought they looked too big to be from the 1960s. Mad Men is a reminder that the sixties will always be a covetable era for style. Not just in clothing, but in art, music and interiors. So everyone go watch it. Warning: you will fall slightly in love with Don, consider redecorating your house, then cry and wish you were born in the sixties. Help: I Want A Beret!